As a film reviewer, I’ve always told myself to give any film a chance. Writing more-or-less full time has given me the opportunity to watch more films, including many that I might not usually have had the time for. Films like Still Life, The Necessary Death of Charlie Countryman and Stretch are just a few of the slightly under-the-radar films that I discovered and loved, thanks to this position. Here’s another. Directed by Ira Sachs and out now only on DVD; Love is Strange tells the story of ageing couple Ben and George, played by John Lithgow and Alfred Molina respectively. After their marriage, George loses his job because of his sexuality, and Ben’s pension alone isn’t enough to pay for their apartment. While they look for somewhere else to live on the money they have, they must temporarily split from each other’s sides to stay at friend’s houses – a situation that weighs heavily on all involved. Alfred Molina and John Lithgow, two of cinema’s finest character actors, shine here throughout. Both deliver absolutely phenomenal performances, and it would be hard to pick the better of the two. Through the gentle subtleties in their performances, you really believe this is a couple that have been together for 20 years. 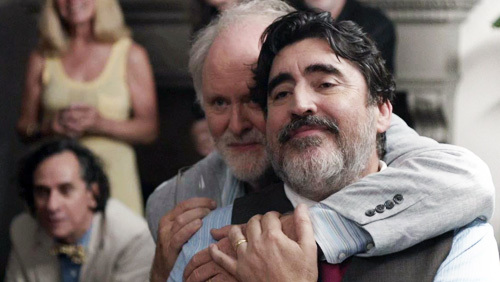 Lithgow and Molina have been friends off-screen for a while, and their friendship is truly evident in their chemistry. The lovely Marisa Tomei shows up with a rather stellar supporting turn too, as the mother in a very dysfunctional family where Ben (Lithgow) must stay, while George (Molina) is staying with his young Game of Thrones loving, Apple TV owning, party animal friends. Love is Strange is a very quiet, understated piece. The soundtrack is made up of well-known classical pieces with Chopin and Beethoven making audio appearances, and the pacing is slow and steady in the finest sense of the words. This is film as art, as well as film as entertainment. Looking for action? Look somewhere else. Love is Strange is the calmest and most peaceful film I’ve seen in a while (save for a few arguments in Marisa Tomei’s character’s household). And despite the fairly slow, quiet pacing; the film clocks in at around 85 minutes – a nice comfortable length that doesn’t even begin to outstay its welcome. This is a brave film, too – can you tell me another which features ageing homosexuals as the main characters? But where the film excels is that the homosexuality angle is not the point, as perhaps it was in the flamboyant Behind the Candelabra. For me, this film could’ve worked with a man and a woman, or two women come to think of it. The title is Love is Strange. LOVE. The film isn’t called Gay Love is Strange. Love comes in many forms and the narrative is relatable to anyone who’s experience it. The utter devotion and care we feel for another person, the need to have them close at all times; these are universal feelings that everyone deserves to have at some point in life. There were scenes I related to, for me and my girlfriend of two-and-a-half years. But first and foremost, yes, Love is Strange features a gay couple at the heart of the story. If this offends you for whatever reason – and it’s not my place to judge – then I would suggest this probably isn’t the film for you. Everyone else? I’d recommend Love is Strange wholeheartedly. I went in with absolutely no idea what to expect, other than the premise of ageing homosexuals. I did not know the plot, I didn’t know if it was a comedy or a drama, I knew nothing. I just knew I liked Lithgow and Molina, and was intrigued to see how they portrayed a couple. 85 minutes later, I left feeling moved and inspired, and would’ve given a standing ovation to the leads if this was theatre – which, it quite easily could’ve been. In conclusion, Love is Strange is a very strong piece. It’s an inspiring tale of love, an entertaining drama-comedy, and a vehicle for Lithgow and Molina’s finest performances to date. Love is Strange. Film is great. 4/5.